Preheat the oven to 350F/180C/Gas 4 and line 1 muffin cake pan with 12 paper cases. Cream the butter and sugar together in a bowl until light and fluffy, and beat in the eggs, a little at a time. Fold in the flour using a large metal spoon. Add the baking powder and a little milk until the mixture is a soft dropping consistency and spoon the mixture into the paper cases until they are half full. Bake in the oven for 20-25 minutes, or until golden-brown on top and a skewer inserted into one of the cakes comes out clean. Set aside to cool for 10 minutes, then remove from the tin and cool on a wire rack. To ice the fairy cakes, drizzle the icing over the cakes, add the decorations (the choice is up to you) and set aside until the icing hardens. 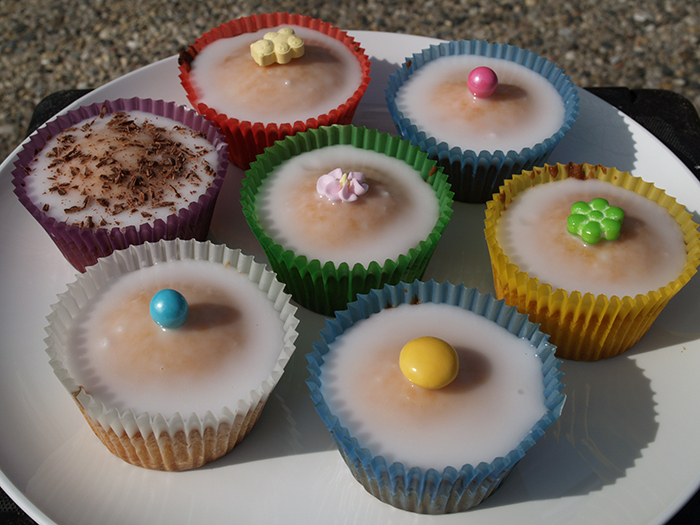 The fairy cakes will keep for 2-3 days in an air tight container.